Did you know you can make cheese with just two ingredients? 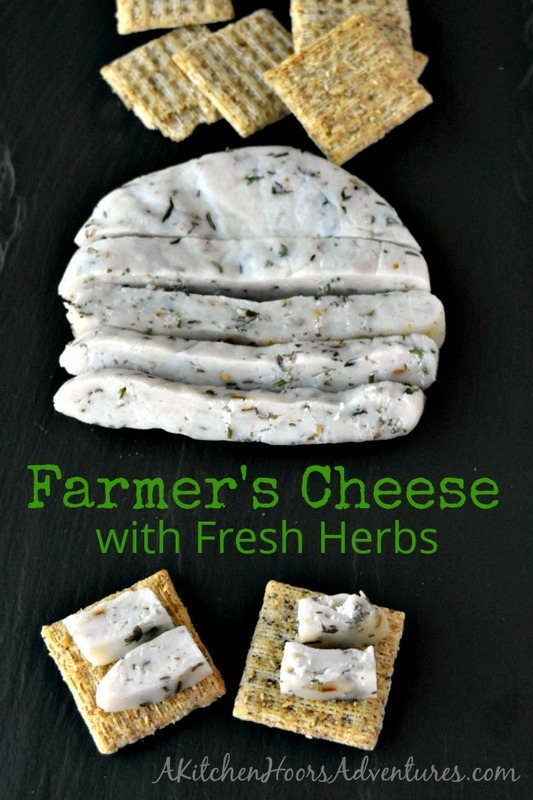 Farmer’s Cheese with Fresh Herbs is so easy to make, you’ll wonder why you didn’t make your own cheese a long time ago! It’s day two of #DairyMonth! A group of bloggers have gotten together to share our love of dairy by posting recipes focused on dairy products. That’s not just milk and not just cows’ milk. We’re making recipes with goats’ milk, too. And cheese, yogurt, sour cream. If it initially started out in a milk form we’re using it! I hope you’ve been following along. There were some delicious recipes shared yesterday for our kick off. Oh, and there’s a giveaway!! Make sure you enter to win a prize pack from the BEST CHEESE EVER Cabot!! Their Vermont cheddar and horseradish are amazing. Heck, all their cheeses are super creamy and delicious. You can’t go wrong with any of them. Even their habanero cheese! Today, I’m making cheese. Did you know you could make a simple cheese with just some milk and vinegar or lemon juice? I didn’t either. I stumbled on it when a blog mentioned making their own mozzarella. Of course that takes rennet which I hear they sell at Whole Foods. I haven’t checked yet. Anyway, after I read that I started on my research for making cheese at home. The first attempt was a total fail. Didn’t even form curds. Just a stringy gooey mess. Little did I know it needs to sit and curdle before you try to strain it! Who knew!? That wasn’t listed in any of the recipes I initially used for inspiration. Now, you could totally have the fresh cheese and it’s delicious. But I saw something about pressing the cheese to make it more cheese-like. Of course, I had to try that!! So, after I strained the fresh cheese. I put it in some fresh cheesecloth and pressed it between two plates with a couple of cans on top. I left it to press for about 6 hours or so? Then I refrigerated it overnight to “cure” and age. After doing all of this, it actually cuts and tastes like cheese. I was total amazed. Of course, I had to taste some on crackers. So, Triscuits it is! It had great flavor from the herbs in the cheese. I added a little crushed red pepper for a little heat to the cheese. It really did taste delicious. I was surprised! This is what the cheese looks like before I pressed it. You could totally serve this up on crackers and it’s still delicious and tastes like a fresh cheese. You can tell how pressing the cheese changes it’s texture and shape. It’s up to you if you want to press your fresh cheese or just enjoy it straight up after straining. Have you ever tried to make cheese at home? Did you know you can make cheese with just two ingredients? Farmer's Cheese with Fresh Herbs is so easy to make, you'll wonder why you didn't make your own cheese a long time ago! Place the milk in a large pot and heat over medium heat, stirring frequently, until the milk starts to steam and bubbles form around the edge of the pot. Once the bubbles begin to form, turn the heat off and stir in the vinegar. Let the milk sit for at least 15 to 20 minutes to allow the curds to form. Line a strainer with cheesecloth and strain the mixture. Gather up the edges of the cheesecloth, tie the top with kitchen twine, and hang it from your kitchen faucet or a cabinet handle suspended over a bowl to allow the weight to continue to drain. Allow to drain an additional hour. Stir in the herbs and salt. At this point you could refrigerate and serve it as fresh cheese. If you wish to press the cheese, wrap in fresh cheesecloth and place between two plates with something heavy (I used a large can of sauce) to press out more weight and allow the cheese to cure for at least 6 to 12 hours. Refrigerate before slicing and serving. I have always wanted to make cheese. You have made it so simple, I think I will finally try it. It sounds great on a cracker. Cheese and crackers are my favorite snack. We grew up eating cheese and crackers with our chili. To this day I can’t have chili without them. The hubs thinks I’m weird. White Oak Cheddar Cheese is my favorite. White oak cheddar? I’ll have to try that! I haven’t tried Farmer’s Cheese but I have made Mozzarella using goat’s milk and it was wonderful. I’m anxious to try this recipe. I wish I could find fresh goats milk. I have no idea where to find it in the store. My favorite is Vermont Sharp! That’s mine, too!! But their Alpine is a close second.